The story of Hanuman and Mermaid Sovan Macha is found in Reamker, the Cambodian Ramayana. The monkey army on the orders of Bhagavan Sri Ram started the construction of the bridge to cross the ocean and reach Lanka. Ravana ordered his mermaid daughter, Sovan Macha, to destroy the bridge. She was the queen of the fishes and ruled over the ocean. The upper half of her body was that of a beautiful woman, while the lower half is that of a fish. She along with her companions started removing the stones placed by the monkey army. Worried and puzzled monkeys complained to Hanuman. 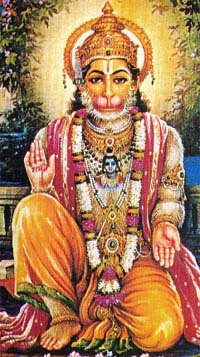 Hanuman went into the ocean discovered that Sovan Macha and her companions were taking away the stones. He tried to capture them but it was impossible. Hanuman then explained to her about their mission to rescue Mata Sita. She and her companions then abandon the idea of destroying the bridge. After listening to the stories narrated by Hanuman, she falls in love with him and marries him.